Nothing is easier than to fear moving forward or to wonder again and again why relationships or a job ended poorly. And yet, we have inner resources - soul-skills - that allow us to interpret the events that have happened in our life from other perspectives. We have a natural intuitive capacity to make decisions that enable us to navigate the unknown, to risk taking the path of our higher potential. Sometimes the best way to introduce a profound truth is to convey it through a parable. We all know what it is like to stand at a crossroads in our life, that powerful, vulnerable position of choice between the known and unknown. And we all know – perhaps all too well – what it is like to wonder what to do next, or why certain events happened as they did in our life that led to us standing at a crossroads. Nothing is easier than to fear moving forward or to wonder again and again why relationships or a job ended poorly. And yet, we have inner resources - soul-skills - that allow us to interpret the events that have happened in our life from other perspectives. We have a natural intuitive capacity to make decisions that enable us to navigate the unknown, to risk taking the path of our higher potential. “Again you challenge me?” The Guru paused for a moment and then said, “Go away from me now. You are not enlightened. You walk through this world only seeing yourself, only feeling your own pain, only fearing your own hunger. What did you see when you looked at that mother and child? You saw only your own pity and heartache – and that is what you wanted me to stop. You did not really see who those two souls were or why they had to endure that path in this lifetime. They abused crippled children in a previous life. They sold them into street slavery without mercy. That mother needs her heart opened. She needs to feel love for a crippled child and that crippled child was once a human being who made his wealth off the broken bones of children. They are being healed but it is through living the life they have been given. Take this life away from them and they will learn nothing. Not even you will learn anything. All three of you will feel better, but what good is that? The Guru continued. “You are still too weak to witness the wisdom of God. You still want your own justice to prevail in this world. You think this world should be ordered according to your personal feelings. If you are upset, then events should be righted so that you feel better, regardless of what is unfolding in all the many other lives woven into the journey of your life. You are still guided by whether you are happy or sad, calm or upset, warm or cold. Why are your feelings so important? Why should they determine the destinies of all these other people? Were they born to insure your happiness? Would you like it if they had the power to change your life because they were unhappy? Or hungry? Or cold? We will explore the deeper meaning of this wonderful story in our first session. The Crossroads is a position we meet again and again in life. It is an archetypal pattern presenting us with the opportunity to start again, or sometimes shift from what feels like a path of fate to one of destiny. Because it is an archetypal pattern, all of us recognize when we have arrived at this choice point in our soul-gut. That is, when you come to a Crossroads in your life: You know you cannot go backwards; you know you have a limited time to ponder which path to take; you know that if you do not consciously make a decision, then the fates will decide for you and finally, both paths offer potentially different futures. Every time we are standing at a crossroads, an opportunity for transformation of some part of our life is being presented to us. 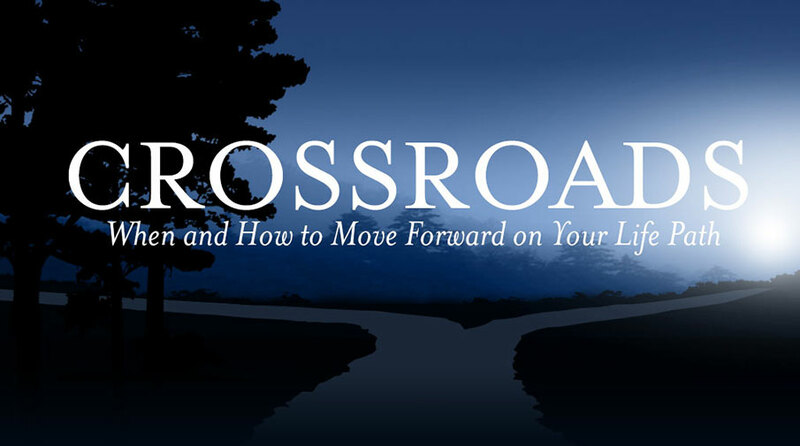 How do you recognize that you are standing at a crossroads in your life? You know it by the questions that you automatically begin to focus on: What should I do next with my life? Where do I go from here? Why did this happen to me? How am I going to survive? I have no doubt that you, like so many of the people I have met through the years, have had exactly this experience. Few experiences are as frightening and none are as common. Or perhaps you might come upon a crossroads you have actually been seeking, only you did not realize it until you arrived at that place of having to make life-changing decisions. Perhaps an opportunity you have been waiting for has finally come along – and now what do you do? Or what if a business idea actually takes off and then comes to a crossroads because it requires an infusion of more capital? A crossroads can manifest as a faith crisis not just in the Divine, but in oneself. I love the parable of The Guru and the Devotee for so many reasons, not the least of which is that each of us in our own way is that devotee walking the road with the guru. (I was actually told one of those stories by a devotee of Sai Baba while at his ashram.) Though we can easily recognize when we are standing on an obvious crossroads in life – one brought about through a job loss, for example – this parable shines a light on a truth rarely reflected upon. That is, the most significant crossroads in your life occur in your capacity to detach from an illusion in order to understand a truth. The Guru tells the devotee that he is not ready to walk the path with him because he still clings to his need to see the world through his eyes, through his feelings, through his needs. As a result, he needs the world – and everyone he encounters in his world – to serve his world. He thinks of the world as his world – not as the world. The Guru points out to him that so long as he sees the world according to his personal sense of justice and righteousness, God would be guilty of mismanagement, of accidents, of egregious acts against the nature of life itself. But the devotee, with his limited five senses and all consuming emotional needs, would of course know exactly what should unfold for all people, bearing in mind the intersection of each person’s karma in past, present, and future lives. From a mystical perspective – which is of course the playing field where truth happens – we actually live at the Crossroads. We are always standing at the intersection of truth and illusion, the mystical language for the known and the unknown. (Reflect on that.) Grasp this profound truth and every decision and choice you make becomes a potential game changer. Fall into a snake pit and though you may not be able to climb out, you can make the decision to calm the snakes, symbolically speaking. You have more authority (note the use of the word authority versus power) within you but it is you that has to decide you are worth the inner journey of self-knowledge. Inner authority and learning discernment – that is, how to discern truth from illusion while standing at a crossroads – requires a commitment to allow your own life path to open to the unknown and to new possibilities. I don’t say that to you as a type of teaser but rather consider for one more moment the story of the Guru and the Devotee. Imagine that the devotee listened deeply to the wisdom of the Guru. Imagine that he truly understood that he was unable to accept Life the way Life had always been and will always be. Instead, he wanted Life to work just for him, to make him happy and to make sense to him for the duration of his short lifetime. He was possessive about Life itself, and Life belongs to no one. Not even His life belonged to him, as he could not extend his life even one more second than his karma would allow. Imagine he finally detached from his own needs and was able to observe Life unfolding in the natural flow of the Tao, including the threads of his own life. He would witness the cosmic Crossroads, at which each personal life intersects with the Divine plan in all ways. Consider your life just for a moment as a constant Crossroads, an on-going power position in which you are endlessly given opportunities to break an illusion. Sometimes that illusion is a fear, sometimes it’s the way you think about an event from the past, sometimes it’s a self-defeating attitude or habit you maintain, and sometimes it’s an opportunity to finally get recognized for your talent if you only take a risk. The truth is, we are living at the continual experience of the crossroads.